Here we are sitting at Munich airport, having checked in and waiting for boarding. We’ve had another excellent day except for the last hour crossing Munich at rush hour with major road works, several km of stop start and crowded five lane autobahns with traffic travelling at up to 120km/h. Our first stop was just over the German border at Mittenwald, a real picture postcard alpine village where we had a walk, visited a church, had a coffee and managed a sketch. Sounds much like the rest of our holiday doesn’t it, except that each place is different. 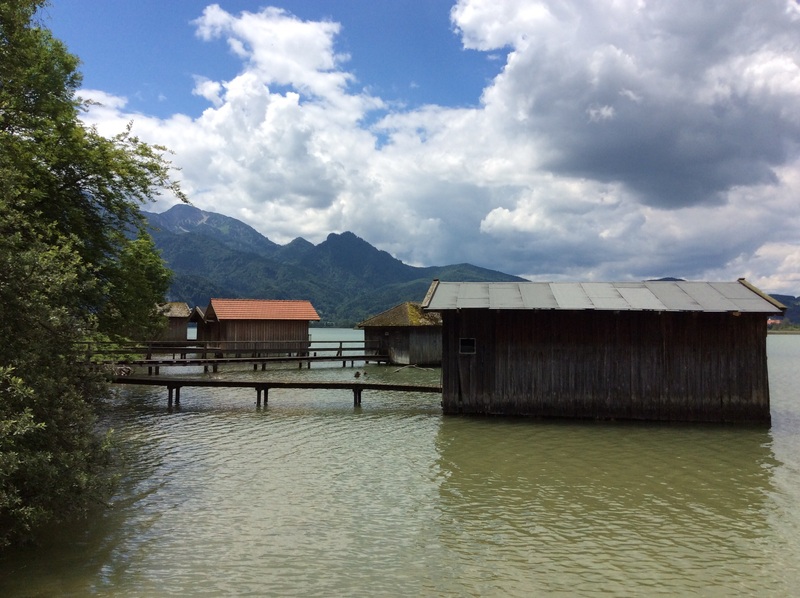 We used “Tim” to keep us off the autobahn and stopped at a couple of charming lakeside towns. The first one was Kochel, a quiet place where we had a walk around the lake and nearer Munich we had a long walk following a tourist map recommended walk around Starnberg which was very enjoyable and featured another church, a small castle and a pizza in a cafe at the lakeside. Homeward bound! Your boat houses will remind you of home? Have a good trip and make the most of warm weather. Be prepared to rug up once back.